In a no-tell motel on Isla Mujeres, eight miles off the coast of Cancún, Yasiel Puig’s escape had come to a halt. Confined to a corner room at the end of a shabby horseshoe-shaped courtyard, he could only wait and hope, for his value to be appraised, his freedom to be bought. There was nothing personal about it, no loved one vowing to pay any price, only the calculus of a crude business. What was this gladiator-size man, with the Popeye forearms and the XXL chest, actually worth—to the people bankrolling his defection from Cuba, to the smugglers now holding him in Mexico, to the agents and scouts who would determine the U.S. market for his talents, to the baseball team that might ultimately write the check? For close to a year Puig had been trying to force an answer, to extract himself from Fidel Castro’s state-run sports machine, which paid him $17 a month, and sneak across the tropics to a mythical north, where even benchwarmers lived like kings. Two, three, four times, maybe more, he had risked everything and fled, only to be detained by the Cuban authorities or intercepted by the U.S. Coast Guard—each failure making the next attempt more urgent. Finally, in June 2012, the 21-year-old outfielder left his home in Cienfuegos, on Cuba’s southern shore, and set off by car for the northern province of Matanzas, just 90 miles from Florida. He was traveling with three companions: a boxer, a pinup girl, and a Santeria priest, the latter of whom blessed their expedition with a splash of rum and a sprinkle of chicken blood. They were met at the water’s edge by a cigarette boat, long and narrow and fast, which instead of racing straight to Miami took them west and then south, following a 350-mile arc to the Yucatán Peninsula. Under Major League Baseball’s byzantine rules and the U.S. Treasury Department’s outdated restrictions, the only way for a Cuban ballplayer to become a free agent—and score a fat contract—is to first establish residency in a third country. That detour is a fiction, winked at from all sides, and one that gives traffickers command over the middle crossing. The five men piloting Puig’s vessel, mostly Cuban Americans, belonged to a smuggling ring whose interests ranged from human cargo to bootleg yachts to bricks of cocaine. At least two were fugitives—one, on the run from a federal indictment in Miami, was alleged to have extorted Cubans traveling this very route. They were all in the pocket of Los Zetas, the murderous Mexican drug cartel, which charged the smugglers a “right of passage” to use Isla Mujeres as a base. Once the speedboat navigated the reefs that shield the three-square-mile island and puttered into the docks at Laguna Makáx, the last of Puig’s obstacles should have been cleared. Free of the Cuban security apparatus, free of the American embargo, he could begin shopping for an agent and showing off for scouts. In baseball terms, Mexico was practically the United States. But almost as soon as Puig had showered off the grime of his trek—after his group had toasted their arrival with an unfamiliar beer, its label stamped with two Xs, and tuned the TV to a Mexican sitcom—the celebration came to an end. The smugglers were anxious to get on with things. The job was done. Where was the money? Puig’s journey, according to claims made in court documents and detailed in interviews, had been underwritten by a small-time crook in Miami named Raul Pacheco, an air-conditioning repairman and recycler who was on probation for attempted burglary and possession of a fake ID. Pacheco had allegedly agreed to pay the smugglers $250,000 to get Puig out of Cuba; Puig, after signing a contract, would owe 20 percent of his future earnings to Pacheco. They were not the first to employ this scheme, a version of which has catapulted many of baseball’s new Cuban millionaires to American shores. It is usurious and expedient, illicit and tolerated. Even if you are as freakishly gifted as Yasiel Puig, there is no humanitarian boat lift delivering you to Chavez Ravine. Every time the smugglers picked up their satellite phone to call Miami, though, Pacheco seemed unable or unwilling to meet their demands. It was unclear whether he was stiffing the smugglers or whether the smugglers were gouging him. For every day of nonpayment, they upped Puig’s price by $15,000 or $20,000. The calls between Mexico and Florida grew furious. The days turned to weeks. Holed up in that dump of a motel, all four migrants in the same dank room, Puig was so close to the prize—now was not the time to lose faith—and yet having just been liberated, his fate was never more out of his hands. The defector had become a captive. 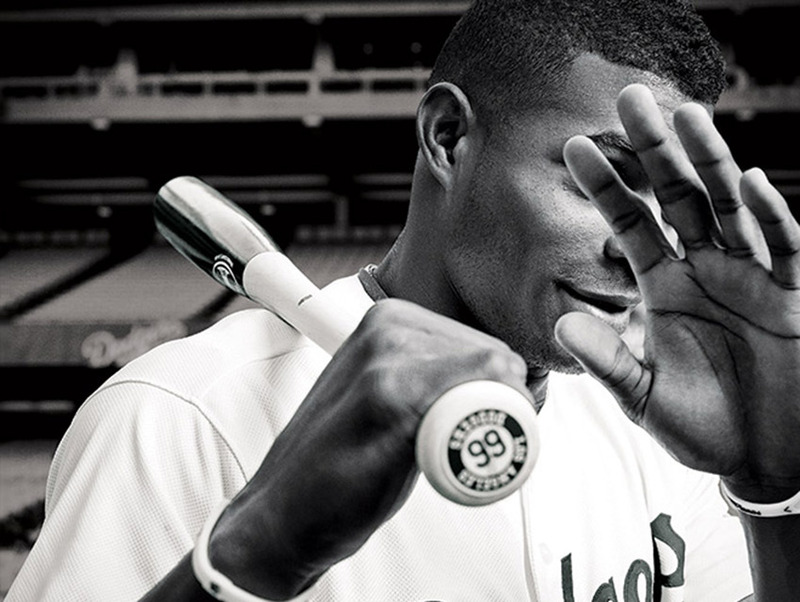 Ever since his debut last June, rescuing the Dodgers from a desultory season and electrifying a city with his fearless, joyful, occasionally head-scratching play, Yasiel Puig has been the biggest story in baseball. He is emotional in a straight-faced game, unpredictable in a sport that glorifies routine, reticent in a town of professional image makers, and enigmatic in the eyes of the largely non-Spanish-speaking reporters who cover him—L.A.’s “International Man of Mystery,” as the New York Post put it. Add to that a pair of arrests, for driving at getaway speeds, and the questions about what planet the 2013 National League Rookie of the Year runner-up is from have only grown more persistent. Puig has never publicly discussed his odyssey to the big leagues or even much of his life before that. Now embarking on his first full season—a test that already this spring has generated headlines about everything from his temperament to his waistline—he approaches the past as if it began the moment he took his spot in right field, as if one day, midstream, he was immaculately reborn a Dodger. But the gamble of getting here, the perils and compromises of leaving Cuba to perform for American fans, did not end when Puigmania began. It has followed him, as similar crossings have haunted other Cuban defectors, exposing the pipeline that both exploits and indulges MLB’s appetite for new talent. “Viva Cuba!” the understated Vin Scully was inspired to exhort last year. “Viva Puig!” Yes, long that he may. Deep in the dense, sweltering fields of Cuba’s rural interior, 150 miles southeast of Havana, the tiny mill town of Elpidio Gómez (population 3,000) has been harvesting, mashing, and extracting sugar from cane since 1873. Slave labor helped erect the factory during colonial times; it was later nationalized, becoming an arm of the state economy. “Revolution is the sense of a historic moment,” says the quote from Fidel Castro that looms over the cavernous shed of wringers and vats. 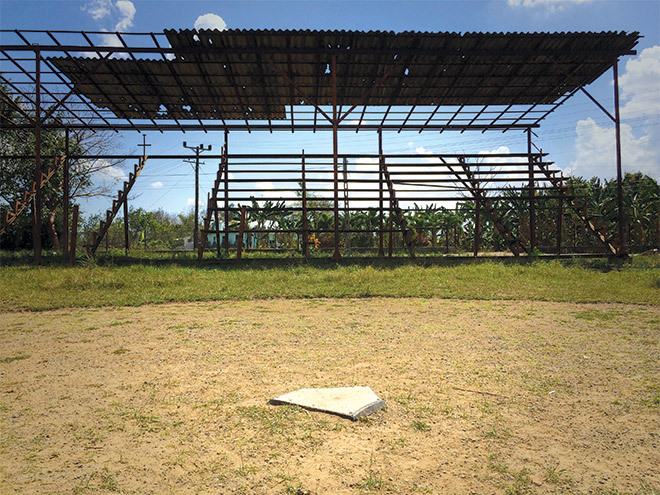 To assure workers a break, to keep their children fit and entertained, the factory grounds give way to a baseball diamond: a scorched patch of earth, the grass reduced to straw. The bleacher is a rusted skeleton, half the benches missing from the frame. The bases are frayed swatches of burlap, salvaged from old flour bags. When Puig speaks of his purpose in life—“I was born to play baseball,” he told me with an earnest nod, before I embarked on a journey that was the reverse of his, from California to Arizona to Florida to Cuba—it was here, under a smokestack belching molasses clouds, that he took his baby steps. A home run ball would have landed almost at his front door. Just beyond the scoreboard, a two-story concrete bunker of cramped apartments, laundry flapping from the balconies, rises from the brush. Puig’s mother headed one of Elpidio Gómez’s subsidiaries; his father, an agronomist, specialized in sugarcane, too. To visit Cuba is to revel in its 1950s retro qualities—the vintage Chevys, the daiquiris and Cohibas—but the scrap of country Puig hails from is even more of a time capsule. Horse-drawn carts shuttle farmhands, in knee-high rubber boots, a few miles east to the municipal seat of Palmira, where a man can walk through the plaza with a machete and not turn heads. Street vendors sell braids of garlic, draped around their necks like Mardi Gras beads. Everything is priced in local pesos, a fraction of Cuba’s official tourist currency; a pint of guarapo, fresh-pressed sugarcane juice, goes for eight cents. The one-room Municipal Museum is devoted to Palmira’s long relationship with Santeria, the Afro-Catholic religious tradition. According to one source, the Spaniard who founded the sugar mill had lugged to the New World a figurine of Saint Barbara, the patron of artillerymen; one of his slaves saw in the fierce young woman the image of Changó, the god of fire and drums. “Everyone in Cuba says that when the drums are beaten in Palmira, the saints come out not to celebrate but to make war,” said a museum docent, inviting me to return on December 4, Saint Barbara’s feast day, to see Palmira erupt into a cathartic jamboree. Until the 1959 revolution, Cuba was practically an extension of MLB’s farm leagues. It is easy to forget that a young Tommy Lasorda pitched four seasons in Havana. After declaring Cuba a socialist state, though, Castro abolished professional ball—he detested a system that bought and sold players like merchandise—and instead launched the National Series, a 16-team amateur league. “This is the triumph of free baseball over slave baseball,” he famously said. Because every player must represent his home province, Puig debuted with the Elefantes of Cienfuegos, a city of 140,000 about a dozen miles from his birthplace. As an 18-year-old rookie, measured against the Elefantes’ greats, Puig was still raw, even reckless. It has been reported that injuries preempted Puig’s second season with the Elefantes, but his indisciplina, which included some unexplained no-shows, was probably to blame. “I watched the next season from the bench for having behaved ‘good’ in practice,” Puig told the Cienfuegos newspaper, Cinco de Septiembre. He returned in his third season to post breakout numbers, which earned him a trip to the World Port Tournament in the Netherlands. Several future big leaguers have used the tournament as an opportunity to defect, and some reports have suggested that Puig earned a rebuke for attempting to do the same. Back in Cuba, when rosters for the 2011-12 season were announced, Puig’s name was missing. His coach is said to have pleaded with government officials to give Puig another chance—the problem child, whatever his transgression, was still the Elefantes’ spark plug—and after weeks of speculation, he was reinstated as a reserve, eligible to be activated after 25 games. Having done his penance, however, Puig never resurfaced. In March 2012, Cuba’s National Baseball Commission finally explained: Puig was “NOT educated and a bad example for the rest of the players.” There was now, for Puig, nothing to lose. An elaborate underground of couriers and bagmen is forever shadowing Cuba’s best ballplayers. So is a state-sponsored network of secret police and paid informants. When you are being lured and monitored at every turn, caught between ambition and duty, survival sometimes means playing both sides. During Puig’s lost second season, in 2010, he was approached by a young couple at Coppelia, the beloved Cuban ice cream chain. The Cienfuegos shop sits on the Prado, a bustling pedestrian strip, and displays a huge billboard across its rooftop with another of Castro’s incantations: “Never will we renounce our principles.” The couple asked Puig to step outside to a waiting car; there another man explained that someone else, a foreigner, was prepared to pay $30,000 or maybe $30 million—Puig would purport to be confused—if he would commit to playing in America. This feature originally appears in the May 2014 issue of Los Angeles magazine.